It's funny how things can change your direction. I had planned on some finishing work this week, but a conversation with one of the members of Plein Air Hooking Artists caused me to change my mind. It was beautiful outside, so why not drop everything and go hook outdoors. I am loving hooking on an easel. 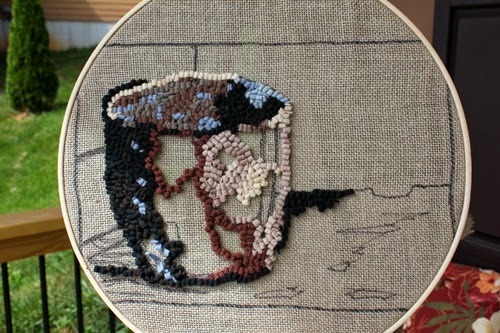 It allows me to stand back and look at the piece I am working on straight on. I have found it a little tricky hooking near the middle as a bar that is on the easel in back gets in the way a bit, but I am working on adjusting this. There is a handy shelf which I throw my wool strips over and also holds my scissors and hook. I did not mind standing the whole time as much as I thought I would, but ended up retying the hoop higher up on the easel for comfort. I have found that my interest is in light and shadow. I have less interest in color, so am now taking a few liberties with that as I hook. Sometimes this is necessary due to wool I have brought with me to work with. It pays to check out your subject before hand and bring colors you think you will need. Here I am focusing on the values of the pot and the darker shadows at bottom left and mid right of it. There are more shadows at certain times of day. Avoid noon when the sun is directly overhead as the shadows lessen significantly. 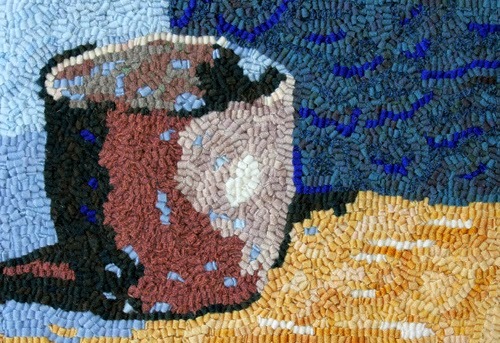 With outdoor light, there can be a glow to certain objects which can be difficult to portray as wool is flat looking. It may be helpful to use other materials such as silk or novelty yarn that has a sheen to it. Focus on values. Outdoors the value differences your eye actually sees are not as great as those that show up on a photograph. There are choices as whether to exaggerate the value differences or keep true to what you see. In this photo you can see how the light is changing over the hooked area so that I was working in half sun and half shade at the time. 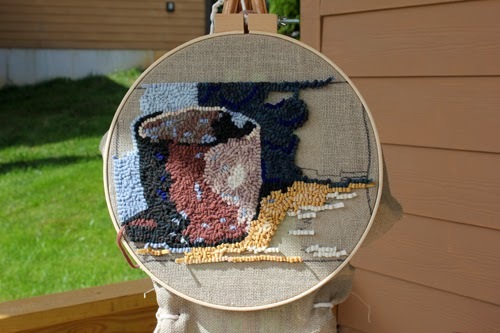 I had to take time to adjust the linen on the hoop as I completed the blue on the left and needed to work on the right side. It would be more convenient to have a larger hoop or perhaps make a flat rectangular frame of decent size to place on the easel. Don't be afraid to change the scene you hook from what you are actually looking at for composition purposes. 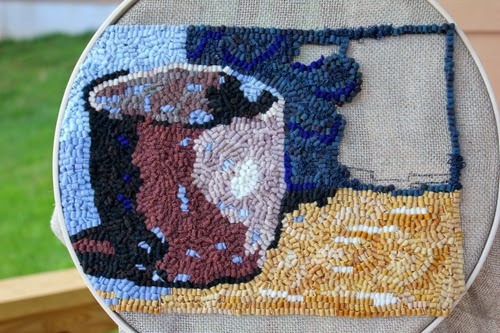 I changed the background to a blue as the dull gray that was actually behind the pot added nothing to the piece and the pot was my focus. We are always learning from our art. Never be afraid that something may come out wrong. Every artist experiences frustrations and difficulties in achieving what they want at some point. Let yourself experience some of this, realize it leads to improvement in future artworks and have a great day. Fall seems to be one of the busiest times of year for artists. Shipping artwork, whether for show or sale, is part of the studio routine right now. It is important that work is packaged to prevent any possible damage in shipment. How you pack also shows the receiver of the work whether you care about your art or not. A sloppy packing job can lose future sales for an artist. Two works were shipped out this past week. Here are some photos from the packing process. The artwork was laid out on the worktable for cleaning and to make sure hanging devices were intact. All work should be labelled with name of artist and title of piece. This should be done on every piece created, but is especially important if the work is being shipped to a show or client. 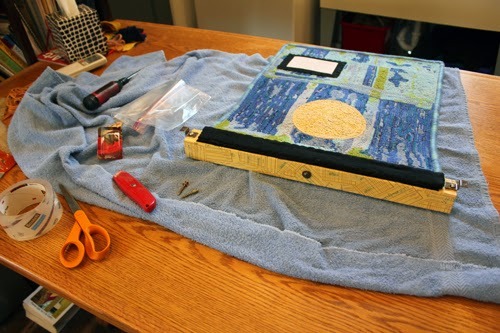 Find a sturdy box that the artwork will fit into. I order quite a few boxes from U-Line. They deliver fast and customer service is good. 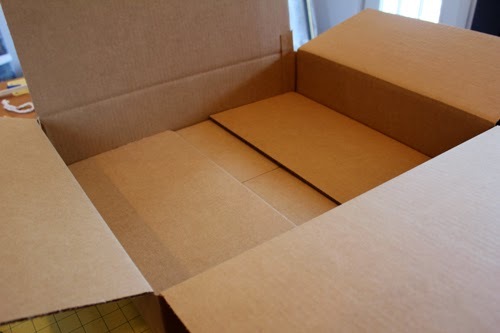 It is best to ship in a box with no labeling on the outside. Who wants to receive artwork in a box that shipped tomato sauce to a grocery store? Yes, I've actually received artwork I've purchased packaged that way before. You need to show that your artwork is important to you and not an afterthought. Foam pads were ordered. One was placed in the bottom of the box and folded on the edge. The artwork was placed on top of the foam. I needed to make sure the tie on this piece would stay as straight as possible and that the upper collage section would not be damaged in any way. Another piece of foam was cut to buffer between the box and the collage. 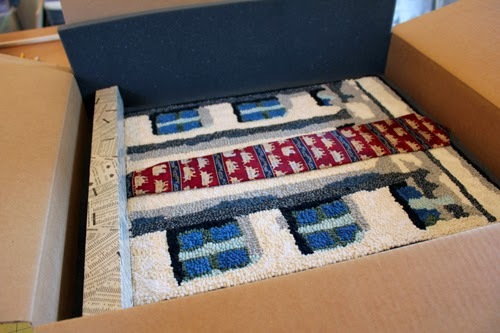 The cut foam was placed between the box and collage and another section of foam was placed under the collage and on top of the artwork. 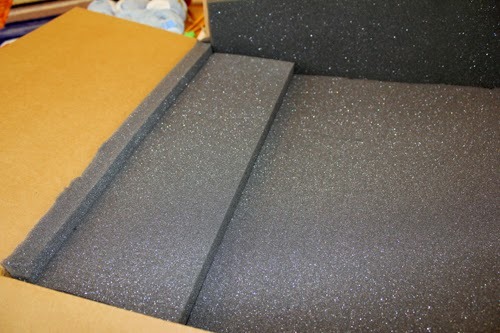 A smaller foam section was placed on top of the collage section. 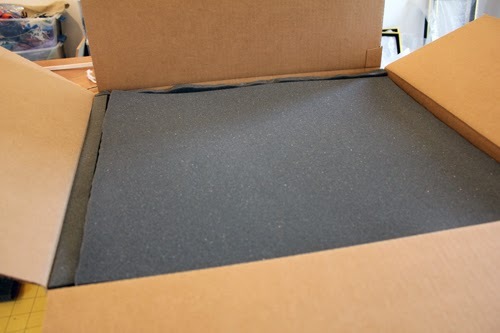 Bubble wrap was placed on top of the lower foam to fill in extra space in the box and prevent the upper foam from sliding down away from the collage is is protecting. 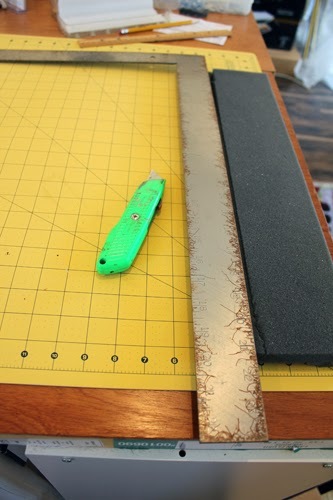 A final piece of foam was cut to fit as the final layer. Everything fits so there is no movement of the piece during the shipping process. The box was then brought to UPS for shipment and a return shipping label was placed inside box. Shipping mixed-media pieces can be tricky. I try to prevent as much movement of the piece as possible. The two sides of chain in the piece above were attached together with a safety pin for shipment. Remember to leave a note about any attachments used for shipping and that they should be removed for show purposes if you are shipping to an exhibit/show. I also tried to brace the pulley in this piece so it wouldn't turn during shipment. I cut two pieces of foam for either side and a shorter piece for under the center of the pulley. 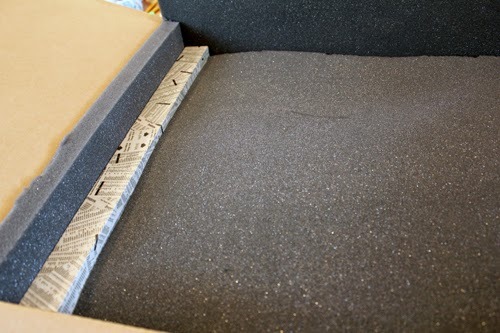 This was then covered with foam and bubble wrap in similar fashion to the first artwork shown. Please be careful with bubble wrap when shipping mixed-media. 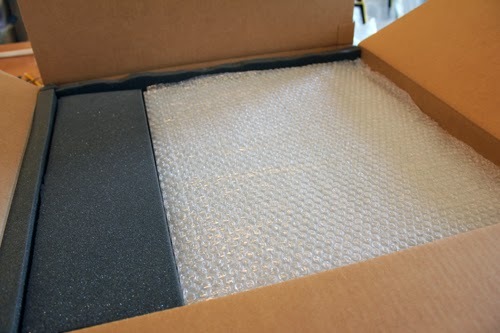 When work is shipped in hot weather, bubble wrap can leave marks on painted, collaged, or glued areas. I have found it better to use the foam and cover the foam with bubble-wrap if the box needs filling at all. 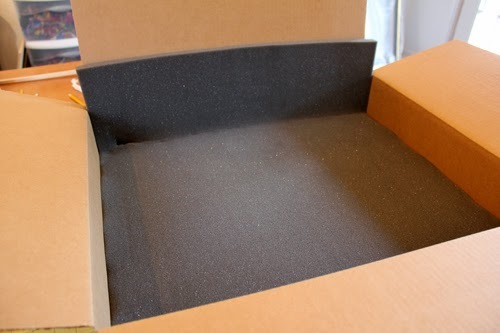 It is best to never use foam peanuts or styrofoam products as they are messy to unpack. Accidents do happen when shipping artwork, but you can do your best to try to prevent it. 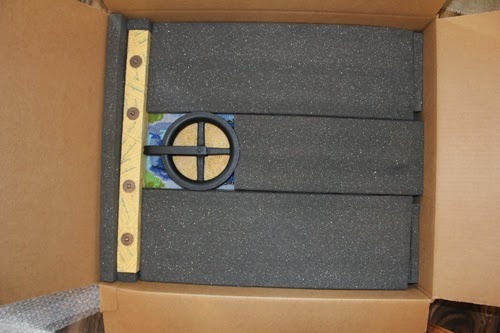 A lot of shipping is learned through trial and error as various styles of artwork require different packing techniques. Think about ways that packaging of artwork can be improved and have a great day. Work was completed on "Center Lines". The idea behind this piece was the no passing and passing when safe lines on roadways. A turquoise blue was used for a solid line and painted washers for a broken line. This will be part of a six piece grouping of 9 X 13 works. The grays against the orange/yellow mix are a great color combination. The darker grays make the orange/yellow really pop. Here you can see the ragged look of the upholstery against the smoothness of the metal pieces. There is rough, smooth, hard and soft combined. It is nice to combine various textures, but there is a need to not overdo it. 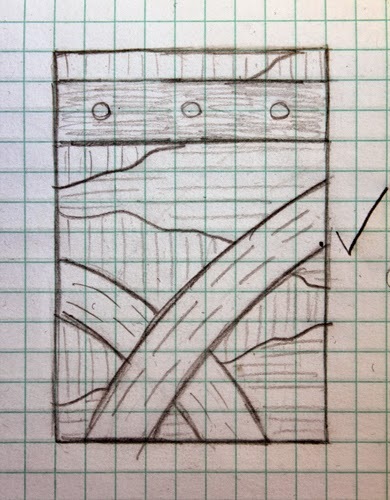 The above sketch was developed from overpasses on the roadway. The original plan was to place three washers on the top horizontal section. I usually place a check mark by the side of drawings in my sketchbook that I would like to use to develop a piece. The final work deviated from the sketch as the three washers planned for the upper section made the piece look top heavy and drew the eye away from the brown curves. I opted for gray lines, the same as the gray at the bottom of the work, through the blue and attached a large washer at the intersection of the curves. The bottom medium gray and three lighter grays were used. In keeping with the textured look of the group this piece will go with, upholstery fabric was used in both of the brown sections. 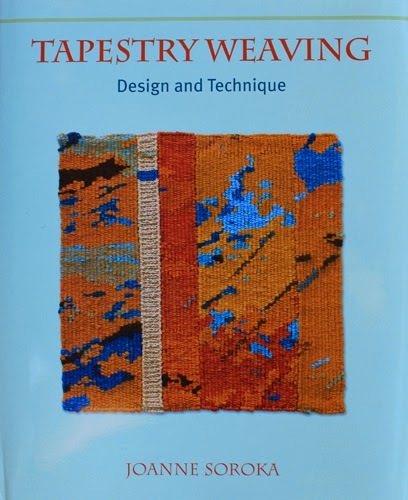 I received a book I had ordered on tapestry weaving this week. 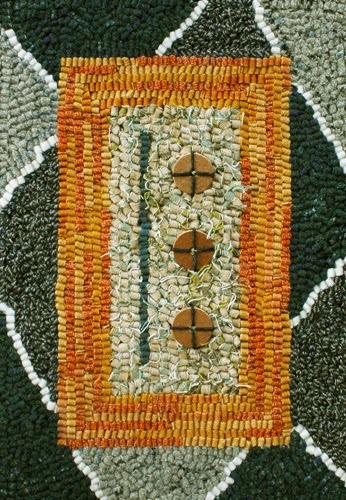 "Tapestry Weaving: Design and Technique is by Joanne Soroka. I have glanced through the book and have just started reading it. So far, the instructions seem to be fairly clear. There are techniques shown for creating various shapes and textures along with design ideas. 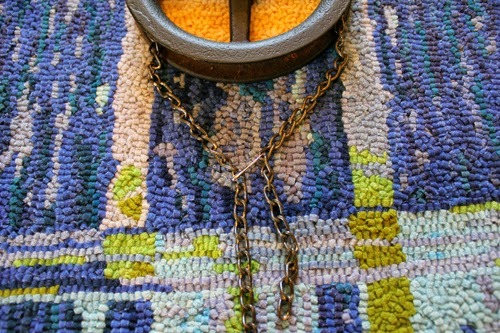 The photos are beautiful with a section on contemporary tapestry weavers. There is also information on suppliers and organizations at the end of the book. I am hoping to take some time this winter to have an at home mini-workshop for myself and experiment with weaving on a small tapestry loom. It is always good to have something to look forward to. Plan ahead for your own mini-workshop on a fiber technique you would like to learn and have a great day. 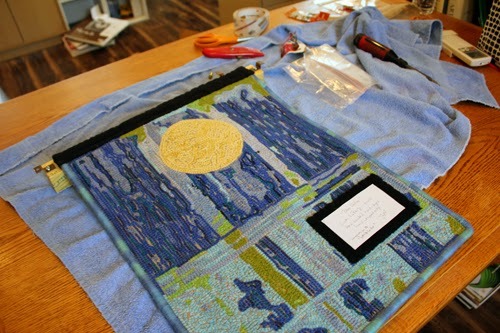 Multiple projects were happening in the studio this week along with bookkeeping, ordering boxes in order to pack work for shipment and delivering work to galleries. While relaxing with a design magazine early in the week, I saw a grouping of six artworks placed together in a living room setting. 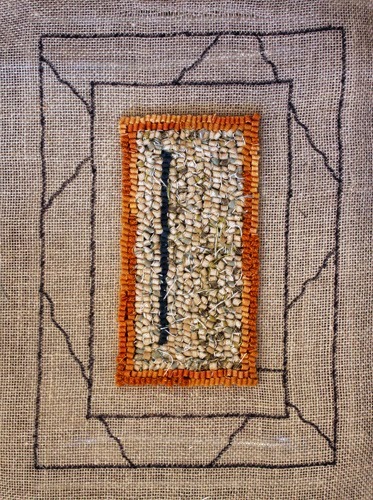 I loved the idea of the grouping and decided to proceed with a group of six rug hooked works using the road series I've been working on. I designed the first of the six and decided on what colors to use. This grouping of the road series will include more texture along with the planned gray and metal I've been using in the series. 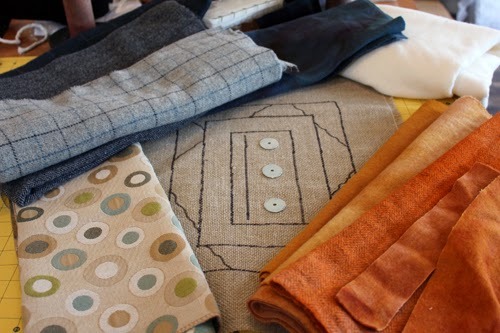 There will be grays, orange-golds, white and a patterned upholstery fabric. 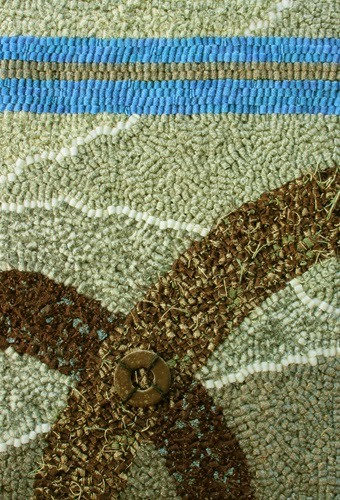 A line of dark turquoise is placed among the upholstery fabric hooked into the center. 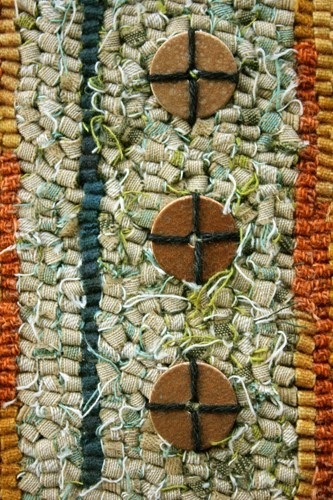 I love the way the upholstery frays as it is cut and hooked, adding another dimension to the work. Metal will be placed on top of the fabric. Each piece in the grouping will measure 9 x 13 hooked and 13 X 17 mounted and framed. These will be perfect size for showing at the Carolina Designer Craftsmen show in November as I already have some larger pieces made. Please check out their website as they have just redesigned it. You can go here, scroll down and see all the artists who will be exhibiting in this year's show. 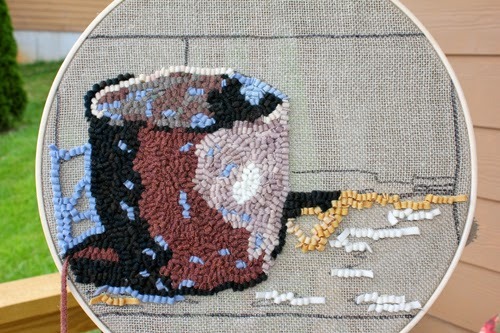 "Thread Factory" is on the work table in the completion stages now. I have the edges wrapped around the spools and will head out today to find a piece of wood to place across the bottom. The wood will be stained and the spools will be screwed to it so the hooked work is held taut. I headed into the great outdoors this week to figure out a new set-up for hooking plein air. 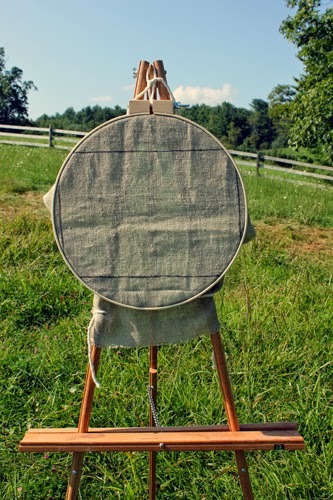 Linen was placed in a quilt hoop and the hoop was attached to a display easel I had in storage. The easel shown is set up for standing while hooking. 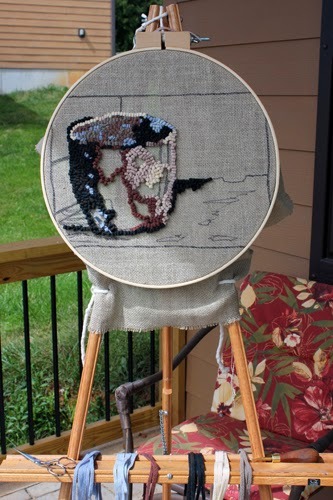 If I decide to sit all that needs to be done is to tie the hoop lower on the easel. The tray allows a place to set my hook and scissors. I am looking for a container to attach to the tray to hold wool strips while I work. Here is a closer view of how the linen and frame were tied to the easel. I tested it out and it worked fine. 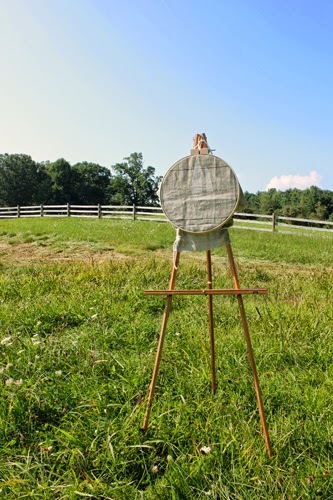 I'm also eyeing a new easel where the work can be turned as you hook which would be great. When looking through magazines, I tend to look for how work is displayed. Look out for groupings of artworks, shapes of works, framing and other aspects that add to the presentation of artwork and have a great day.